Gear: I bought a closeout REI bag that stuffs down to the size of a casaba melon, but weighs about the same as a basket of strawberries, poured some leftover TJ’s two-buck Chuck into a steel bottle, and put that in a big ziplock baggie. I took my toothbrush, and the almost-done Tom’s cinnamint I put aside for the occasion, and my asthma medicine. Fat wool socks and lightweight Carharts and another wool tee shirt for sleeping in, and the ride down. That was about it. No pad, no cooking gear, and two power bars. I was going to bring a pillow, but forgot. “Whatever, I’ll just put my extra clothes in the sleeping bag stuff sack, and use that.” Which was a good plan, but the “extra” clothes were the ones I’d just changed out of, and they were soaked with sweat from the climb up Diablo. Ew. I used my spare top and a shoe for a little height. It worked fine. It all fit inside a borrowed Large Saddlesack. That’s a cool thing. Harry gave me some zip ties, and I zipped it to the rack, and cinched it to the saddle and post. I just put my sleeping bag, loaded shoulder bag and Carradice saddlebag right into it. Bike: Borrowed Rivendell Hillborne. I would have liked to ride my Quickbeam, but I didn’t want to be the last one up and the last one down. My two geared bikes aren’t very Rivendelicious, but would have worked fine with some clever strapping. Basically, I wanted to have the full experience, albatross bars and all. Keven also roasts his own coffee beans, which he turned into an Americano for me, complete with organic heavy cream from Trader Joe’s. I bought some stuff (green tape and a King cage) with my $25 Fundo credit (a surprise to me), and we each got a “special prize for filling out the waiver form,” which was a Grin Fundo patch. Totally cool. People came and went, including Manny’s crew of hard men, bound for a bandit camp higher on the mountain. 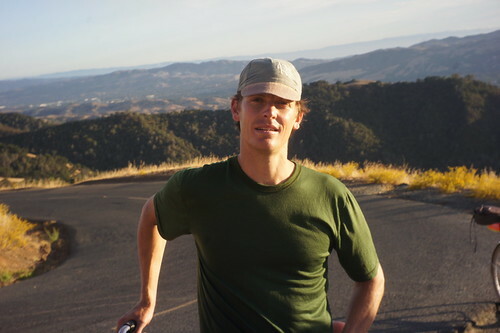 The Ride Up: When Grant arrived, we rolled out across Walnut Creek to the base of Mount Diablo, and started to climb. My hands sweat a lot, and on the bare metal of the albatross bars, I didn’t have the grip confidence to “pull through” on the climb, so I just geared down and spun. Diablo to the Junction is a significant climb. We met Manny’s crew a little below the Junction, and I chatted with Brencho and took some pictures. Camping: We dropped down from the Junction, and then down a dirt road to a camp with about 10 spots. We took the “host” site when we found one of our reserved sites was taken by a family. We didn’t want to make them shift their tents and kids, which seemed like a hassle. Also, the host site was much flatter. I was at a loose end after setting up my site. I flopped the bag on the ground, laid on it, moved it sideways nine inches so that my hip would fall into a natural depression, laid on it again to make sure, and parked my bike next to it. Done! We ate lots and lots of Cowgirl Creamery “Mt Tam,” which is brie-ish, with a subtle crackle of lactose crystals (according to Nick (“El Duke Degreaser”), who is a food scientist). There was another Cowgirl* cheese, and plenty of dark chocolate, and nuts, and other paleo-ish fare chosen to keep eaters in ketogenesis. Alain brought some Oban whisky in a flask, which was extremely well chosen. I’ve been to Oban, but never had the whisky. He also hipped me to Yamazaki, which I’ll try to find. Random assertion I am interested in confirming: Cancer cells cannot replicate in a ketogenic environment. The Ride Down: Steep huff up out of the hollow we camped in, and a little regroup on the dirt climb to the dirt descent. Grant gives a short primer on descending on dirt, and realizes he’s left his glasses at the campsite. No big deal. They’re the green safety glasses Rivendell used to sell. Optically correct, and stylish in a no-style way. Made in America, but they don’t make them here anymore. He’s had them for 20 years. Mark asks if the way down is easy to navigate, and Grant says there’s one fork, and you just keep right. Mark turns around and drops back down the trail to get the glasses. Nick opts to go out early, because he has two young kids to take care of, and Alain does the same, carefully picking his line down the steep fire road on the Ebisu. We faff long enough that Mark returns with Grant’s glasses. They really are pretty nice. Lots of descending steep rough steepy roughness, and riding along a ridgeline where you can look into two valleys at the same time. I heard Puck had never ridden offroad, but he aced it on a borrowed loaded road bike. At the bottom, where the exposed ridgeline turned into shady mellowness and stream crossings, Grant said, “I’m surprised nobody crashed. I really thought someone would.” Huh. I like the matter-of-factness about the possible risks of worthwhile behavior. Chatted with Grant a bit about Oregon and Santa Rosa and people we knew, as we found our way through streets named after Indian tribes. Had another Keven Americano, some more cheese, and said goodbye. The Drive Home: Whoops. Trying to get into Sonoma County via Vallejo on a race weekend is bad. Having time to listen to music and think is never bad, though. *Small world: I just found out tonight that one of the co-founders of Cowgirl Creamery is my friend’s cousin’s wife’s sister. My friend said it like it was a thing I should know. **I got to use this fact just yesterday at a party in Santa Cruz, and shared the concept of Selenium Toxicity with someone who already knew that brazil nuts had 100% of your daily requirement.